While I love visiting tried and true destinations in Texas (I’m looking at you Magnolia Avenue), I also like to find things to do that I haven’t done before. 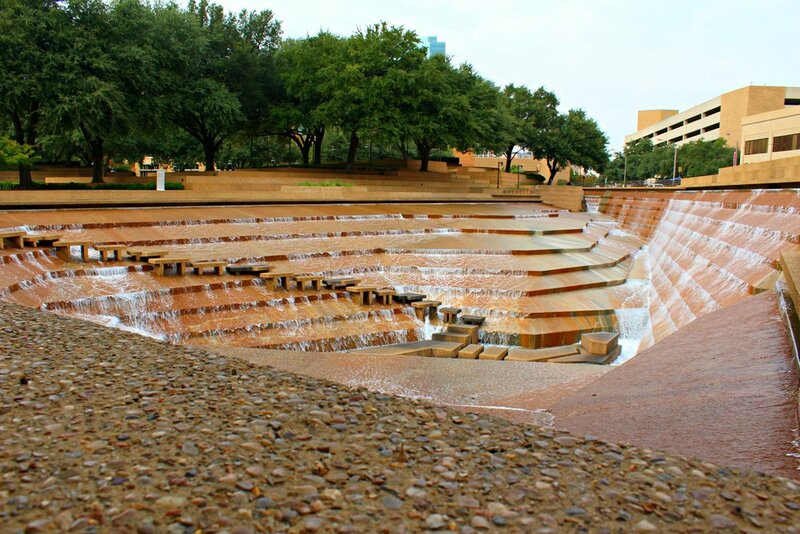 The Fort Worth Water Gardens have been on my list for years now but I never seem to make it. This last time in Texas, I finally did! I wasn’t sure what to expect. To be honest, I had done the research years before and only remembered that it was supposed to be a peaceful and beautiful place to visit. The gardens are made up of three different water features with shrubbery and landscaping throughout. It’s not a place you spend lots of time in but it’s a great spot to reflect or simply sit and clear your mind. 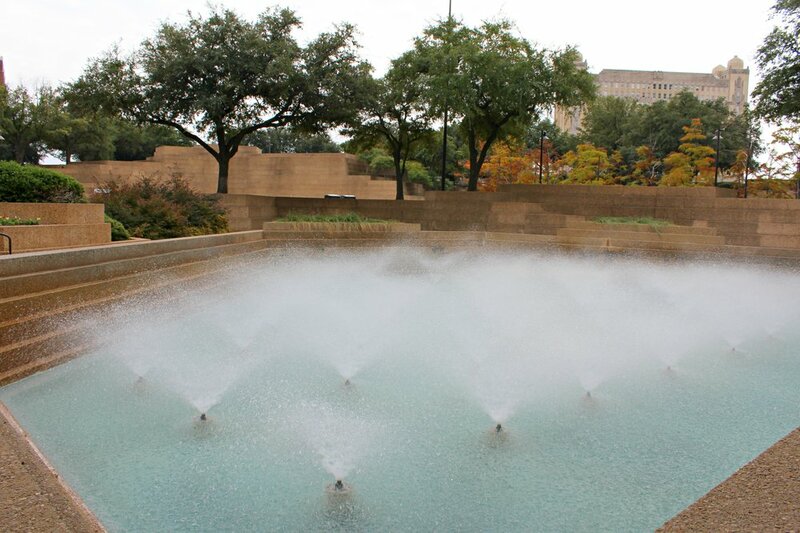 The Water Gardens are right outside of the main Fort Worth square, across from the Convention Center. There’s street parking along Commerce Street and the train station that runs between Dallas and Fort Worth is on the other side of Lancaster Street. I walked in on the Commerce Street side right where the main water feature is located. It’s difficult to explain what the main water feature is like. It’s got all these layers that act like steps but they almost seem like they’re floating. Water drapes over each layer culminating at the bottom in a captivating motion. Anyone can walk down towards the bottom of the garden although I did not feel stable enough managing the stairs. Oh the woes of us clumsy folk. If you like to listen to white noise, ocean waves, or rain to fall asleep at night, the Water Gardens have that same effect. The sound of the water is calming and the motion of the water focuses your brain. If zen were an object, this water feature would be it. The Aerated Water Pool is another one of the three water features. There are about a dozen or so fountain-like things in a pool of water that spray misty water. This produces a softer sound compared the the main Water Garden but it still has the same effect. Finally, the quiet pool is almost still water. It’s a great spot for reflection. The water is crystal clear and the walls surrounding the pool have a steady stream of water like it’s overflowing from the level above. I hope I’m explaining these well because it’s a bit difficult. I spent 20 minutes walking through but it was a nice escape from a rather busy work week. It was also something different from what I usually do while visiting Texas and something that I’m glad to have experienced. Check out the slideshow below for more photos. If you’re looking to fill more time in your day, Hell’s Half Acre is near the northwest corner of the Gardens along Houston Street. Hell’s Half Acre was a red light district in Fort Worth in the late 1800s. It consisted of boarding houses, gambling spots, saloons, and other businesses and became known as a place for high and violent crime. Many criminals hid out in Hell’s Half Acre and it was a place of "dark indulgence" for men. The history is really interesting and there are rumors that it’s now a haunted area. Lots of famous names have been associated with the spot including Butch Cassidy & Sundance Kid. Sound familiar? Before the turn of the century, Hell’s Half Acre was ultimately destroyed and is now only identifiable by a plaque and bronze statue. On a lighter note, Sundance Square is a short walk away from the Water Gardens as well. There’s plenty to do there from shopping to dining and live entertainment. Grab photos of the gorgeous opera house and St. Patrick’s Cathedral whose history goes back to the 1800s. Sundance Square alone has plenty of regular events from live music to movie screenings. It’s one of my favorite places to visit while in Texas and I absolutely recommend spending a day or so there.